Social media might be all the craze that's going around right now, but you can still not get the depth of interaction that you get with a customized email to your customers. That is where weForms email marketing integrations shine. Not only is it more personal for each of your customers but also it was sent with their consent. Which automatically means they were expecting some sort of email from you. It gives a large window of opportunity to present in a personalized manner whatever great offer you might have for them. Keeping the tradition of making things that work best for you, weForms comes with a number of popular email marketing solution providers integration. weForms is the fastest contact form builder on the market right now. Not only is it fast but also it packs more features than all of its competitors combined. It comes with a drag & drop form builder (One Page Submission via AJAX), mail support feature, email marketing integration, productivity tools integration, multiple payment integrations and much more. Campaign Monitor: Easy-to-use, professional-grade email marketing and automation for today’s fast-growing businesses. Aweber: Affordable and easy to use email marketing and autoresponder tools. MailChimp: Send beautiful emails, connect your e-commerce store, advertise, and build your brand. MailPoet: WordPress newsletter experience made simplified. Constant Contact: create effective email marketing and other online marketing campaigns to meet your business goals. ConvertKit: Get the automation and email marketing tools you need to grow your blog and business. For any kind of publication, everything begins with the content. At the same time, your content appreciation is subjective. It will be as good as the amount of attention it captures of its consumers. weForms gives you a robust form builder with many field options that you can choose from. Ranging from simple text, name fields to more complicated section break, custom HTML, action hook and so on. You will even be able to create forms that interact with your customer as they react to it by using conditional logic. With its extremely versatile field options, you can create really captivating newsletter subscription forms that are bound to get the attention of your customers. That is why weForms supports the most number of email marketing solution integrations in the market right now. Using already established email marketing solution providers out there widely used by some of the biggest companies, you can give the boost in customer retention that your business needs by using weForms and its email integrations. 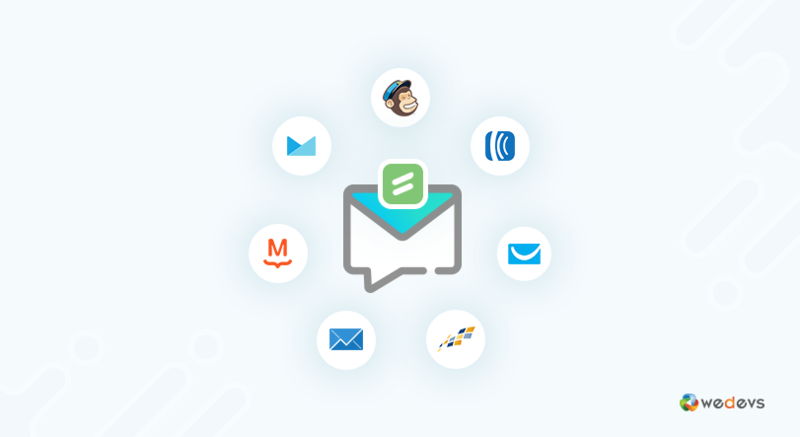 Imagine you are using the popular email marketing service MailChimp for your organization. 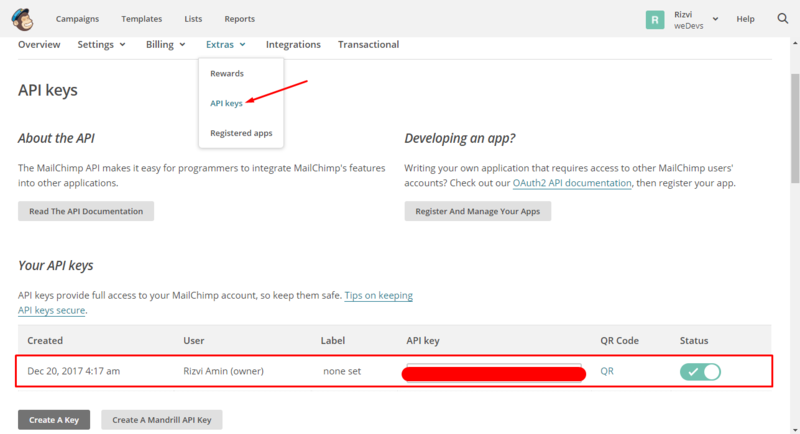 With weForms built-in module for MailChimp, you need to simply enable it and set the API key that you can get from your account. You can find the API that you need to copy from your MailChimp account. You can find it from the account section(in the Extras menu) of MailChimp. Now if you go to the All Forms and create a new form(customize it in a way that your users like it) for newsletter subscription services you will see an option in the integrations menu to enable MailChimp. After enabling you will be able to see your MailChimp account mailing lists(the account that you created in for your organization/business). Map it your desired liking. There is even an option to enable double opt-in. Now if someone registers at your form his credentials will automatically be sent to your mapped contact list. This is just the tip of the ice burg. The possibilities of how you can improve your subscription rates are up to the creativity and the hustle of your team. “Who is the biggest player in email marketing automation?” the answer can change any day. Each provider has it's unique strengths and weaknesses. Keeping up with latest technologies and implementing them in a manner that improves customer experience is a very crucial factor for market survival. weForms eliminates your worries about who to choose and gives you the opportunity to use all most all of them. So that you won't be crippled when things go down the hill for one of them and all you can do is sit back and watch. It takes really hard work to build an email subscription list that you are proud of, weForms just make your road to that goal a little frictionless. If you have your business on the internet than it is undeniable that your interaction with your customers will create your brand. And in this era of information overload, it can get a little bit crowded. That is where you have to show your talent and use the right tools for your business. Include a can't miss call to action, pop-ups, slide-ups are just theory that you can implement. But without proper and feature-rich tools you won't be able to execute them. In the WordPress ecosystem, very few if none offer the flexibility that weForms gives. It doesn't mend you to work in its confined ways, instead, it adapts to how you want it to work. List broker services are your key to reaching the ideal audience for your direct marketing campaigns. Use at home business mailing lists powered by our genuine and up-to-date business data. Purchase direct marketing lists for marketing targeted consumer lists, business lists, new mover mailing list, email list, and specialty lists.